It’s been a while since I’ve done a linky roundup, and there are all sorts of things going on around these parts. It’s San Diego Veg Week! Pledge to go meatless from September 25 to October 2. There are grocery store shopping tours, cooking classes, nutrition lectures, and more to help get you on track. Most people could benefit from a more plant-based diet, and a week without meat isn’t going to kill you (or any creature, really). If you’re in San Diego, I was also featured in San Diego Magazine’s article about veg week. Could you give up meat for a week? Why or why not? Not ready to give up meat? What about processed food? 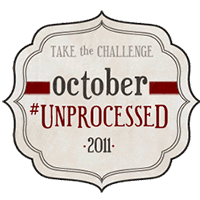 Join Andrew at Eating Rules for the October Unprocessed Challenge! That doesn’t mean you HAVE to make it yourself, just that you COULD. Try eating foods with no preservative, stabilizers, artificial colors and flavors, and other chemicals. See how you feel. Who’s signing the pledge? (I already did.) Neither of these are departures from my normal diet, but I think getting new ideas and paying more attention to those choices is a valuable exercise. If you think either of these challenges is too hard, why? In other news, the charming Stephanie over at Recipe Renovator interviewed me about my health coaching practice. Go read this article, please. How was your weekend? I played a lot of soccer and bought some random groceries in preparation for a 5 day detox. I’ve never done one, so I figure 5 days is a reasonable starting point. Nice interview. You sound SO grown up now!! And I liked the accompanying article. Good thing we both like to cook! Happy Birthday today. Next post: What’s the Deal with Detoxes?